I have a dear friend named Molly. Molly turned 20 in August, so I made her cupcakes. So I made chocolate. Super, delectable, melt in your mouth chocolate. You see my friends, Molly is very much worth it. I couldn’t just make a simple chocolate cake with chocolate buttercream (although, that would be wonderful too). You see, Molly has this crazy personality, so simple definitely would not work. Instead, we start with a suuuuper incredibly moist chocolate cake. And then we fill the center with coffee flavored ganache for a nice little surprise when you take that first bite. After it’s filled, this Molly cupcake gets a huge dollop of whipped chocolate ganache. More ganache, that’s right. (Do you know what ganache is? Pronounced gah-NAHSH, this simple yet perfect thing is made from chocolate and cream, and can be used for glaze, frosting, filling, or eaten by the spoonful. It’s rich and smooth and velvety.) After the ganache, chocolate shavings are a must. 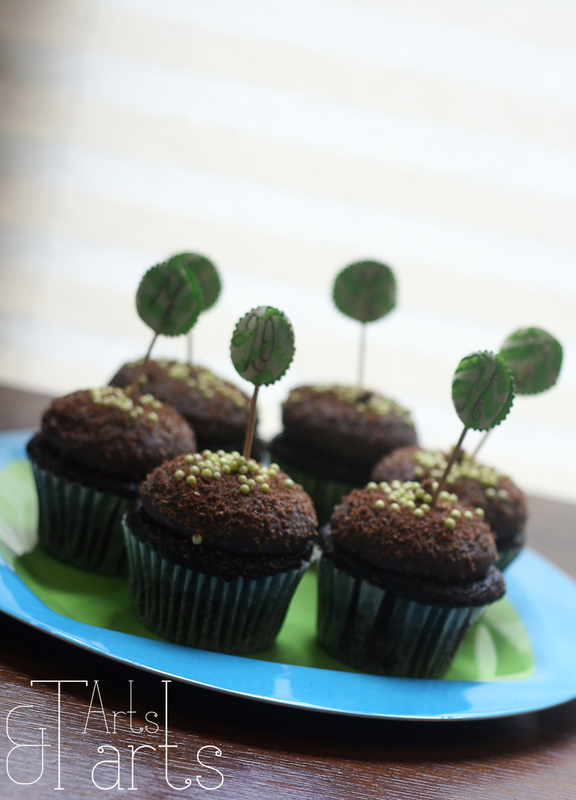 Then, green (Molly’s color) pearl sprinkles and cute toothpick signs complete Molly cupcakes. It’s impossible to put Molly’s character into words. I want to say spunky and peculiar, lovely, animated, and curious, to say the least. There will never be a dull moment with this girl around. And did I mention that she is oh so incredibly talented? She is. Preheat oven to 350 F. Line cupcake tin with cupcake liners. In bowl of electric mixer, combine all dry ingredients. Add all remaining ingredients to bowl with the dry ingredients and mix until very well incorporated, about 2 minutes on medium speed. The batter is supposed to be very thin. Pour the batter into prepared cupcake tins until 2/3 full. Bake cupcakes for 15-17 minutes or until toothpick comes out with just a few crumbs (moist is what we’re going for, so no clean toothpicks!) Let cupcakes cool for about 5-10 minutes in the pans, then transfer to a wire rack to finish cooling. Chop the chocolate into pea sized pieces. Combine chocolate and butter in a medium sized bowl. Set aside. Combine sweetened condensed milk, heavy cream, and sugar in a medium saucepan. Bring to a boil. Once mixture boils, immediately pour over chocolate and butter mixture. Let sit for five whole minutes, then whisk well until incorporated (It might take a bit of whisking before it’s completely incorporated). Set aside 1 cup of the ganache for the filling. The remaining ganache will be for the whipped frosting and needs to be cooled completely. When it has cooled (and is much thicker) the ganache is ready to be whipped. Transfer the ganache to the bowl of an electric mixer fitted with the whisk or paddle attachment. Whip on medium until light brown and fluffy (5-10 minutes). Use immediately to spread or pipe onto the cooled cupcakes. The ganache will firm up more once spread or piped. Mix about 1 cup of prepared ganache with 1 tablespoon strong black coffee. If you want a stronger coffee taste, add very fine instant coffee powder or espresso powder to taste. If no coffee flavor is desired, omit coffee and just use ganache as is for filling. When cupcakes are completely cooled, fill the centers with some of the ganache. There are a few techniques out there for filling cupcakes, and Annie’s Eats has a good tutorial with photos for three different methods you should check out here. For my cupcakes, I chose to use a pastry bag fitted with a round tip. To do this, insert the tip into the cupcake and squeeze to pipe in a small amount of the ganache. When the cupcakes are filled, use a pastry bag to pipe the whipped ganache onto the cupcakes (I used a round Wilton 2A tip). Alternatively, spread a big dollop of the whipped ganache on with a spatula. Either way tastes perfectly divine. Top with chocolate shavings and sprinkles, if desired. 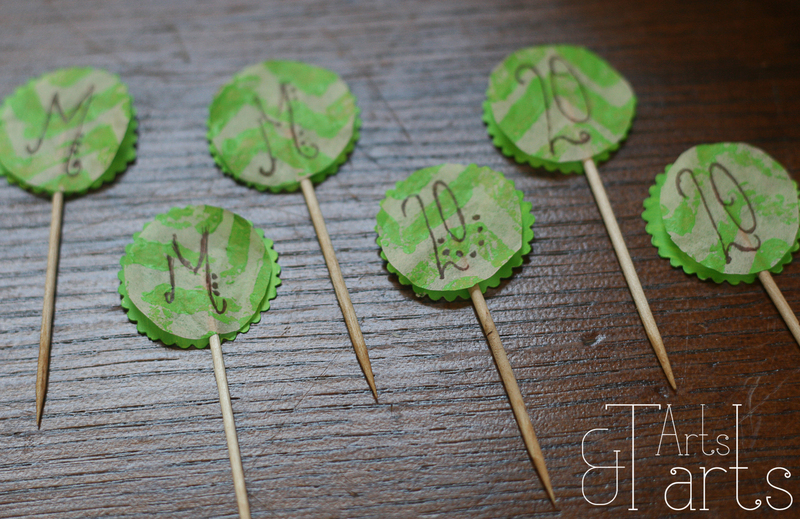 Cute little toothpick signs are another fun option! P.S. Molly enjoyed her cupcakes, here’s Instagram proof. . .
Chocolate Cupcakes slightly adapted from Sweetapolita. Ganache adapted from this post. This entry was posted in Baked, Chocolate, Cupcakes, Dessert, Recipes, Uncategorized and tagged baking, Birthday, cake, Chocolate, chocolate cupcake, Cupcakes, Dark Chocolate, dessert, ganache, recipe. Bookmark the permalink.